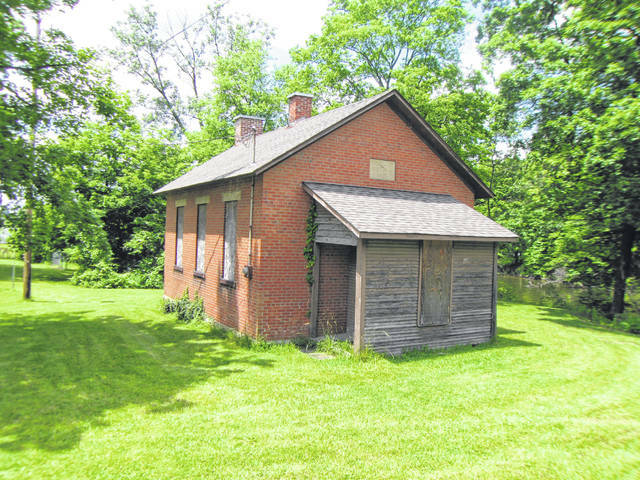 Pictured is the Red Bank one-room school locacted on Red Bank Road in Delaware County. Mindy Pyle will present the program “Early Genoa Township Schools” to the Big Walnut Area Historical Society at 7:30 p.m. today in the Myers Inn Meeting Room. Pyle is a trustee of the historical society, and the program is free to the public. Earliest settlers made do by teaching children in a home, shed or any building until schoolhouses were built. The first schools in our community were primitive subscription schools erected by volunteer labor. Logs cut 16-feet or 18-feet lengths were used for the construction. Broad boards composed the roof. Each had a fireplace and a clapboard door. If there was a window, it was probably greased paper to let in light. Students’ benches were fashioned from trees. A subscription of $1 to $3.50 per child was paid for a three-month period. Teachers boarded with the families. Readers consisted of The New Testament or Old English Reader. Grammar was rarely taught. In 1853, Ohio revised it’s education system by law forming a Township Board of Education for each township. These boards consisted of one representative of each sub-district school and the clerk of the township. This group was invested with the title, care and custody of all school property. They appropriated the money among the sub-districts, determined what text books were to be used, fixed the boundaries of the districts and located school sites. They reported to the county auditor annually. City and incorporated villages acted as their own sub-district. Each sub-district (usually 6-10 per township) had a school, so children did not walk more than a mile or two to school. Each had a local board of directors who controlled the schools. They enumerated the children of school age, employed and dismissed teachers, made contracts for the building, and furnishings of the schools. The state bill also eliminated the rate-bills and made education free to all youths in the state. Thus, one-room schools began to replace the primitive schools. Typically, these structures were 22-by-36 from outside to outside. Usually, they were brick with more than one window to provide light. Each had one door, a chimney (usually for stove) and generally a blackboard, as well as benches and tables or desks. During today’s program, Pyle will go back to the start of Genoa schools in 1821. She will discuss the beginnings of the Genoa schools and go into detail about the first four school sub-divisions in the district. Many of the original school buildings still remain today. “We will also partake in an exam that students were given to see if they were ready to move beyond 8th grade. Do you think you will have the knowledge to pass?” asked Pyle. “My passion for local history and education stem from my own family history. My family has generations of educators and has been part of the Sunbury community for many years. My grandmother, Carol Wirick, was an art teacher and a substitute teacher in Sunbury as her children were growing up. My great-great aunt, Esther McCormick, taught home economics and wrote many books on the history of our family and Sunbury. I have been an educator for the past 12 years and have lived in Sunbury since 2006,” Pyle said. Myers Inn Museum faces the southwest corner of Sunbury Square. It is open noon to 3 p.m. on Thursdays, Fridays and Sundays, and 10 a.m.-3 p.m. on Saturdays. For more information, visit us on Facebook, Twitter or our website at http://BigWalnutHhistory.org. Information for this story was provided by Polly Horn.